Nathan P. Gilmour , 19 January 2014. The more one studies the Old Testament, the more continuity one sees with the New Testament. Also, the more one studies the Hebrew Bible, the more distinctions one finds between it and the Christian Bible. My hunch is that such a paradox would not have come as much of a surprise to those early generations of Christians. After all, the new Way of Jesus no doubt would have shaken up the old alignments of synagogue and Temple, Law and Prophets, in ways that they must have regarded as new. On the other hand, the narrative universe into which Jew and Greek alike entered was without a doubt a network of prophecy, proclamation, and worship of the God of the Exodus that makes no sense without the Scriptures. 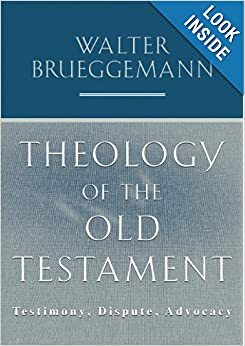 Brueggemann spends a fair bit of time on the nations in general, but those orders he calls “superpowers” of the Old Testament (Egypt, Assyria, Babylon, Persia) get special attention. What staggers a reader when surveying the Old Testament’s treatment of those powers is plurality. The narrative of YHWH vs. Pharaoh in Exodus stands in stark contrast to the conversion story of Nebuchadnezzar in Daniel, and the mysterious strike against the armies of Tiglath-Pileser in Isaiah could scarcely differ more from the court intrigues of Esther. Neither the neoconservative nor the post-colonialist is going to find the whole of the Old Testament comfortable reading; the great empires, like any nation or for that matter any human being, fall into the narrative of YHWH’s life with the world, living out the stories of gathering, scattering, and re-gathering and neither accumulating sufficient might to stand immune nor falling so far from good fortune that no re-gathering is possible. So there is no uniform “right way” to stand in relation to the great political powers of one’s moment: instead the Bible teaches the faithful to be mindful, to see how things are moving and to respond faithfully both in the moments when YHWH manifests most clearly and in the long stretches of silence and darkness. But even as I write that, I can sense the long narratives of the Bible tugging at me. Brueggemann is right: an imagination shaped by the Bible will not allow for permanent states of surrender. Every lament has inherent in it the celebration what will happen when YHWH turns things around. That’s not to pretend that the evil is not real, much less that the evil is itself good because YHWH might make good of it. And it does not mean that we can forsake the responsibility of taking this stand or that in favor of a historical relativism. But it does mean that things are always on the move.